Belize first attracted me because of the spectacular Caribbean seascapes and the vibrant offshore barrier reef teaming with colorful, diverse sea life…the laidback lifestyle…affordable cost of living…and the friendly Belizeans. With such an enticing, balmy environment it’s natural to spend a lot of time outdoors. 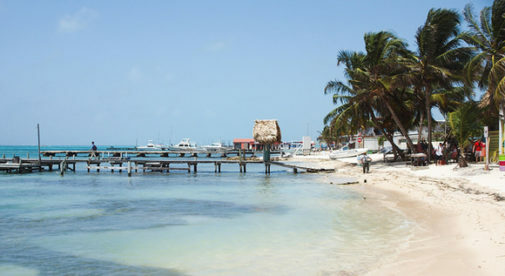 The warm sun, soft sand, and breath-taking scenery make it a pleasure to travel around town on foot, or on a bike, especially if you live on a caye, or in a beach town. Many expats who live on Ambergris Caye skip the golf cart entirely. They walk or bike most of the time, but call a friend, or their favorite taxi driver, when hauling a larger than normal load of groceries. 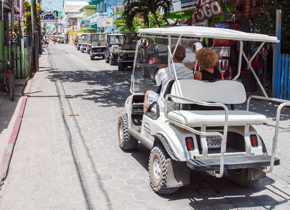 Golf carts are the primary form of transportation on Ambergris Caye, and an affordable alternative to fueling and maintaining a car. The most popular pastime is walking on the beach. Others prefer to swim in the warm Caribbean Sea, ride their bikes around town, snorkel or dive, kayak, paddleboard, or sail. A few of us love to kick up our heels to a live band on the beach. For expats who live inland, they can hike or mountain bike in the gorgeous rolling foothills of the Maya mountains or through ancient Mayan ruins, horseback ride through the jungle, canoe or swim in a river, or just float in an inner tube on a lazy day. Whatever your personal preferences, it’s hard to resist enjoying Mother Nature’s many treasures in Belize. Beyond outdoor activities, there are an increasing number of “organized” exercise options. Some days I head for the Train Station gym. Other days I join in on a group yoga lesson at Zen Belize…although my favorite spot for a yoga class is over the sea and under a palapa, cooled by the sea breeze. There’s a social aspect to all this activity too…we often socialize after class or head out for a cappuccino. A lot of my expats friends keep themselves busy in this way… Lynn Ann and Tony walk their dogs on the Placencia beach for at least an hour a day. They often join another couple for these beach walks. Tony also plays volleyball at Mangoes, in Maya Beach and Lynn Ann regularly takes a yoga class. Belize also has plenty of fresh fruits, vegetables, fish, shellfish, and chicken. Much of the country’s produce, chicken, and cheese come from Mennonite farmers. So the food and produce are fresh, not tainted by the chemicals used at corporate farms in North America. The fish and lobster are freshly caught from the Caribbean Sea. The standard Belizean diet includes plenty of beans and produce such as sweet carrots, zucchini, avocados, sweet potatoes, peppers, squashes, papaya, oranges, grapefruit, limes, bananas, and chaya, all of which are tasty…and healthy. Most expats here have embraced this healthy, active lifestyle that Belize offers. Of course, the added bonus is that they have little stress in their lives here compared to living back in the States.